The vast spaces of the Great Plains are a barren and unforgiving landscape, but beautiful in their starkness and profound in their emptiness. This photo of Southwest Kansas is Dustbowl territory, and on this particular day it feels like it: sustained winds of 40mph and temperatures of 100 degrees. Lost in this sea of emptiness is a lonely old branch of Santa Fe origin. 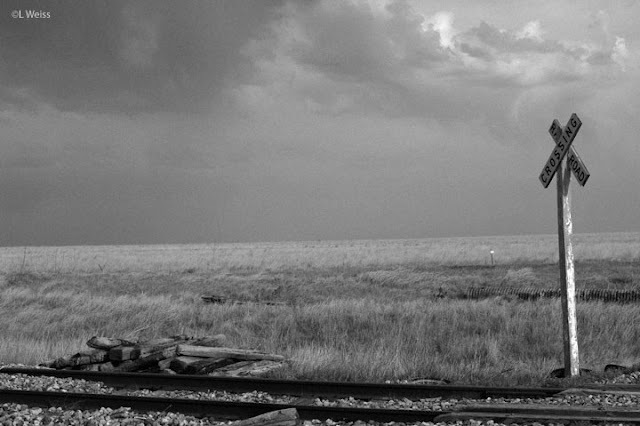 It is a thin ribbon that still plies these great plains, connecting what is left of the small towns beneath hot and endless skies. Some have offered the roaring 20s as the "Golden Age" of U.S. passenger rail. The famous named trains that were born from this general era are numerous and memorable. The 20th Century Limited, the Broadway Limited, the Phoebe Snow, the Chief, and Golden State Limited are only a few of these famous trains that arrived during the first quarter of the twentieth century. Long forgotten are the innumerable unnamed trains that existed only as numbers, but branched out from the country's main lines and connected the small towns and places scattered off the beaten paths. 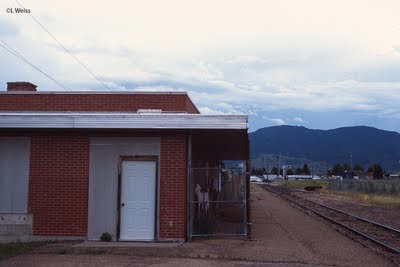 Many of these were mixed freights, comprised of only a passenger car or two and freight cars that were switched at the small towns along the way. At its peak during WWII, the U.S. passenger train network accounted for 90 billion passenger miles.